Creeper is one of the most dangerous mobs in Minecraft PE because its explosion practically kills you if you are near it. His behavior is predictable and everyone knows that after he starts to tsss, you have a few seconds to run away. The Creepy Creeper addon upgrades the old poor creeper and changed his appearance. 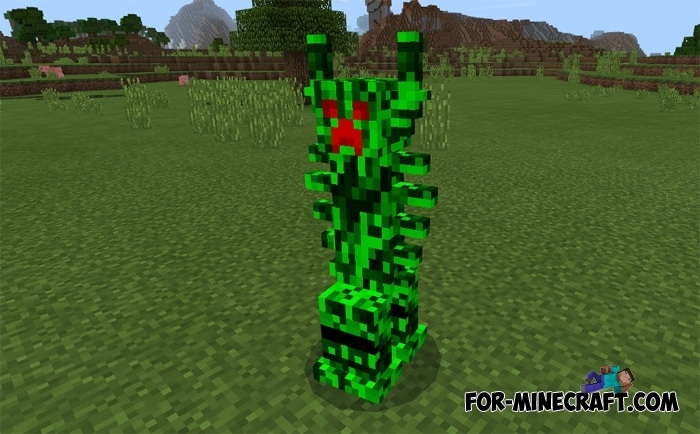 Now the creeper is more creepy and its main purpose is to climb on your shoulders. After this, there will be an explosion that will instantly kill you. Such creepers always explode at a time when you do not expect it. In general, the Creepy Creeper addon is a great addition if you have a desire to collect a dangerous creatures pack and unite them into one addon.